During World War II, Britain executed 16 spies under the Treachery Act (1940). Of the sixteen, fifteen were tried in civil court and hanged, either at Pentonville Prison or Wandsworth Prison. Only one enemy agent, Josef Jakobs, was tried by court martial and subsequently shot at the Tower of London. This anomaly - one court martial and execution by firing squad - still puzzles some readers, but is easily explained. 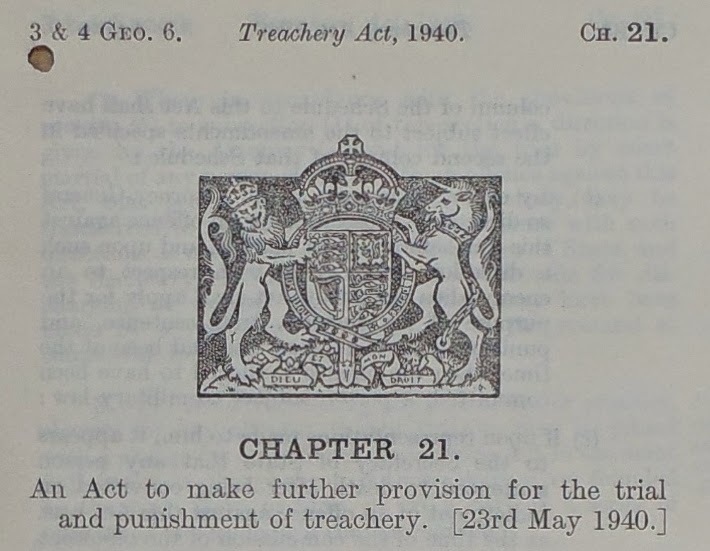 Under the Treachery Act of 1940, a court martial was reserved for members of His Majesty's Armed Forces, members of the enemy's Armed Forces and some enemy alien civilians (at the discretion of the Secretary of State). Josef Jakobs was a German citizen (an enemy alien) and also claimed to be a member of the German Armed Forces. He was a prime candidate for trial by court martial. A soldier sentenced to death by court martial was accorded an honourable death by firing squad. Under the Treachery Act, civilians from Britain or neutral territories had the right to be judged by a jury of their peers in a civil trial. Their sentence was generally death by hanging. In cases where the nationality of a civilian was in doubt, they were to be given the benefit of the doubt and allowed a civil trial. In cases where an enemy alien was tried jointly with neutrals or British nationals, the trial was also to be a civil one. At one point, during the summer of 1941, Karel Richter was being considered for trial by court martial but officials couldn't decide if he was Czech or German. If he was Czech, then he was a neutral and should be granted a civil trial. But the Sudetenland area of Czechoslavakia where Richter was from had been annexed by the Germans. If Richter was German, then he was an enemy alien and should be tried by court martial. In the end, the officials decided to give Richter the benefit of the doubt and he was tried by a civil court. If we look back to World War I, we find another execution anomaly, but the opposite one. During World War I, Britain executed 12 men as spies under DORA (Defence of the Realm Act). Eleven were shot at the Tower of London after either: a war crime trial (one case), a court martial (eight cases) or a civil trial (two cases). One man, Robert Rosenthal, was tried by court martial and, upon conviction should have been executed by firing squad. Such was not to be his fate as, on 15 July 1915, Rosenthal was hanged at Wandsworth Prison, the only spy to suffer such a fate during World War I.
Robert Rosenthal was born in 1892 in Magdeburg, Germany to Jewish parents. He was apprenticed to a baker in 1906 but the post did not agree with him. Returning home after several months, he obtained a positionin a lamp store. After committing a forgery, Rosenthal was dismissed from his post and sentenced to three months' imprisonment. Robert Rosenthal - 23 years old. Upon his release (1907-1908), Rosenthal went to sea, spent a bit of time in America visiting relatives and eventually found himself back in Hamburg at the start of the war. In late 1914, Rosenthal agreed to travel to England under the guise of a cigar-lighter salesman. He arrived at Folkestone in November 1914 using an American passport in the name of Harry Berger. Rosenthal's presence in England went undetected by the British authorities and Rosenthal sent several letters back to the Continent with secret ink messages. He left the country in December 1914 and returned in early January 1915 on a second mission. He left the country a week later but returned for a third mission in April 1915. On this occasion however, his luck ran out. Rosenthal was apprehended by the British authorities on 11 May, 1915, as he tried to board a ship sailing from Newmarket to Copenhagen. It turned out that Rosenthal himself had tipped off the English authorities. A short while previously, British Postal Censorship had intercepted a letter in a mail bag from Denmark. The letter was addressed from Copenhagen, Denmark to Berlin, Germany and had been included in the postal bag by mistake. It was written by Rosenthal and informed his Berlin handlers that he was about to set off on an espionage mission to England as a cigar-lighter salesman. Port and Immigration authorities were notified and Rosenthal was nabbed. Faced with the letter, in his own handwriting, Rosenthal confessed and offered his services to the British authorities. His offer was refused. On 11 July, 1915, Rosenthal was tried by General Court Martial and found guilty. He was held at Wandsworth Detention Barracks (a section of Wandsworth Prison had been designated as a military prison) and made two attempts to commit suicide, both unsuccessful. 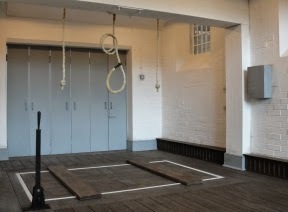 Wandsworth Prison - The Gallows. At 8:00 a.m. on the morning of 15 July, 1915, "Rosenthal, escorted by two stalwart policemen, went to his death." (Felstead) Apparently he was "dragged to the scaffold crying his innocence and protesting his willingness to do any service for England in return for his freedom". (Wild & Curtis-Bennett) "Towards the end he broke down badly and gave unutterable disgust to the authorities by his lack of common courage. In fact, the commandant described him as a 'cur' ". (Felstead) All of Rosenthal's pleas and protestations fell on deaf ears and in the end executioner Thomas Pierrepoint pulled the lever and Rosenthal's life was over. There are two theories as to why Rosenthal was hanged and not executed by firing squad after his court martial. In 1920, Sidney Theodore Felstead wrote a book about the German spies in England during World War I. He indicated that "for reasons connected with the military occupation of the Tower it was decided by the authorities that the spy should suffer death by hanging." A few short weeks later, on 30 July, 1915, two German spies (Roos and Janssen) were executed by firing squad in the Tower moat instead of the miniature rifle range. It is possible that, at the time of Rosenthal's execution, the miniature rifle range had already been torn down in preparation for the construction of the new one. The second theory is a bit darker. In early 1940, British officials were wrestling with the logistics of court martials, enemy aliens, hangings and firing squads. The War Office was asked to explain why two spies (Breeckow and Muller) were tried by civil courts and executed by firing squad while Rosenthal was tried by court martial and hanged. One H.T. Allen, War Office wrote back and noted that "the reason why [Rosenthal] was hanged and not shot was the subject of an investigation in MI5 in 1932. It was then reported that there was no record of the reason in MI5, War Office or Home Office files, but the investigator reported that he heard at the time 'that the Court considered a bullet too good for him on account of his extremely cowardly behaviour during the trial." Interestingly, a biography of Henry Curtis-Bennett (Rosenthal's defence counsel) noted that while Rosenthal was "a completely contemptible, cowardly type", he actually "bore himself well" during the actual court martial. Andrew, Christopher. 2009. Defence of the Realm - The Authorized History of MI5. BBC Radio I. World War I at Home. 6 November 2014. Wandsworth Prison, London: Where Military Prisoners and Conscientious Objectors were Held. Felstead, Sidney Theodore. 1920. German Spies at Bay - Being an Actual Record of the German Espionage in Great Britain During the Years 1914-1918. National Archives - Lord Chancellor's Office file (LCO 53/54) - Correspondence leading to draft Treachery Bill 1940. Thomson, Basil. 1922. Odd People - Hunting Spies in the First World War (republished 2015). West, Nigel. 2013. Historical Dictionary of World War I Intelligence. Wild, Roland & Curtis-Bennett, Derek. 2010. King's Counsel: The Life of Sir Henry Curtis-Bennett.